Whenever the name of Shirdi is mentioned, Sai Baba’s charming face comes in front of the eyes of the heart of Sai Devotees. The head of the devotees automatically bows down and the hands get folded. The incredible leelas of Sai Baba are continuously showered on His devotees not only in India, but also in the whole world. The fragrance of His infinite blessings has been scattered in all the ten directions. Sai Baba pulls His devotees from many paths to Shirdi. The way He calls His devotees is beyond the understanding of humans. The devotees have a strong desire to meet to Sai Baba in Shirdi. The Prasadalay of Shirdi also attracts many devotees’ attention. The noble work of feeding the needy on such a grand scale is not done anywhere in India except in Shirdi. In Kaliyug, Daan is advised to human beings in Shashtras. Thus one should regularly feed the hungry and thirsty beings. In Dharma the importance of Annadaan is the foremost. Whenever a needy come to our door for food, we must feed him readily. In this context, Sai Baba was (and is) the greatest example. He used to gather all the spices and raw material Himself and cooked the food in Handi. He satisfied Himself by feeding devotees, poor and needy by His own hands. Really those people were very lucky and fortunate that they could eat the food prepared by Sai Baba. 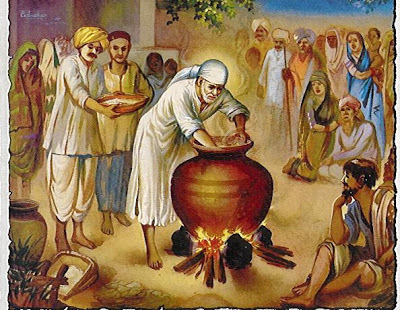 The description of the donation of food and Handi is very well narrated in chapter 38 of Sai Satcharitra. This work is going on today also. Now it is done by Shirdi Sansthan in the name of Prasadalay. Prasadalay is a place of Shraddha of Sai devotees. Sai devotees partake this food as Sai prasad with Shraddha. It should not be considered only as a lodge or low cost hotel, but the correct meaning of the word Prasadalay has to be considered, so that the Sansthan’s hard efforts and purpose (Seva Bhav) behind it can be understood. The specialty of Prasadalay is that it provides foods to devotees to their hearts content for just Rs. 5 !!!! Only Sai Baba can give food by charging only Rs.5 in this Kaliyug. About 15,000-20,000 people get benefit of this Prasadalay everyday. On holidays and festivals this figure reaches upto 35,000-40,000. About 1,000 devotees are fed free of cost. The Sansthan incurs an expense of Rs. 9 per dish. But only Rs. 5 from adults and Rs. 2 from children are charged per dish. Sansthan incurs about Rs. 6 crores for feeding devotees in this Prasadalay. Sansthan stocks about 8000 quintals of wheat, 5,000 quintals of rice, 3,000 quintals of whole gram, 6,000 quintals of sugar and about 1,000 quintals of Tuvar (lentil) dal. There is a big Bhandar Gruh (godown) for storing these things. About 1000 devotees can take food at a time in the huge hall of Prasadalay. About 75000 devotees per year take the advantage of this Mahaprasad of Sai Baba. Prasadalay is open from 10 AM to 10 PM i.e. it works continuously for 12 hours daily. The chapattis is another speciality of this Prasadalay as they are thin like paper and very smooth. To do this work cooks from Gujarat are hired. There is machine to break coconut which Sai devotees offer as Prasad in the Samadhi Mandir premises. One half is given to the devotees and the other half is retained by the Sansthan. Now a question arises that what does Sansthan do with so many coconuts? The answer is that sanstahn uses this coconuts for devotees only for making Kopra Paak (a dish made from coconut, sugar and ghee, the name given here is its Gujarati name, popularly known as Khobra Chi Wadi in Marathi). The work of feeding is managed very nicely here. Every small point here is taken care of. Before buying all the material, quality is checked and the best one is selected. Wheat, grains and chillies are grinded in the grinding machine of the Sansthan. Gas and solar cookers are used for preparing the food. Sansthan has installed latest solar cookers by spending Rs. 16 Lakhs. Food for 3000 devotees is prepared in the solar cooker during day time. In this way about energy worth Rs. 4-5 lakhs is saved. The quality of the food prepared in solar cooker is the best as the natural nutrients and minerals are not destroyed. There are two dish washers for cleaning the dishes which are used to feed. To clean up the wheat and grains a machine with numerous facilities has been installed. About 60 quintals of waste is separated by this machine everyday. Everyday about 35 quintals of wheat and other grains are grinded in a grinding machine including three special machines for grinding whole gram. Sansthan has kept a special machine for sifting the powder of wheat, grams and a special machine for making flour smooth for preparing chapatti/roti, puri and laddoos. Another machine is used to cutting the vegetables. The work of cooking is done in two shifts. One shift is from morning 7 till afternoon 3 and the other is from afternoon 3 till 11 at night. More than 40 cook work in each shift. In the manner of Tirupati Mandir prasad of Bundi Laddoo made of pure ghee raisins, cashew nut and cardamom are sold as prasad to Sai devotees. Today many devotees have forwarded their helping hands in this matter. About 60,000 laddoos are distributed daily. Three laddoos made of pure ghee are provided in just ten rupees considering the rule of no profit no loss. Devotees purchase these laddoos as prasad of Sai baba, some partake in Shirdi and many are taken to their own towns for distribution to other Sai devotees. To prepare the laddoos about 13 quintals of sugar are used by the Sansthan. The work of making laddoos is continuously done from 7 in the morning till 10 at night. Laddoos of about Rs. 4 crore are sold during the year. Other than this, packets of snacks are also provided. In this age of inflation, with the grace of Sai Baba good quality of breakfast is provided in only Rs. 3. The packet of breakfast contains puri, vegetable and kopra paak. Breakfast worth Rs. 25,000 is sold everyday. Sansthan has started a canteen that runs 24 hours for devotees. The speciality of this canteen is that devotees are provided tea and coffee with a nominal charge of Rs. 1 and Rs. 1.50. Sansthan has made arrangements for lodging of devotees who are flocking from various parts of India in a very nominal charge. They are provided a clean and spacious room in Bhaktidhaam for only Rs. 100. Sansthan has now decided to serve two types of vegetable instead of only one. Many Sai devotees gave their consent regarding this. Sansthan has also decided to use high quality basmati rice for serving food. Another Prasadalay will be constructed in 100 acres of land in front of the Sansthan with full fledged latest technologies and facilities. A cost of Rs. 15-20 crores is estimated for this Prasadalay. About 2,500 Sai devotees can be served in this new Prasadalay at a time. After having visit to five big tourist places in South India as Bangalore, Tirupati, Puttparthi and Hyderabad, the board of directors of Sansthan declared that the hospitality given to devotees visiting Shirdi is supreme as compared to these. The Prasadalay (existing and to be constructed) will draw attention of many Sai devotees (and others also) not only in India but from the whole world. The management of this Prasadalay gives an example to the management students and also to others. Hats off to the Prasadalay of Shirdi and its Manager Sai Baba!! !